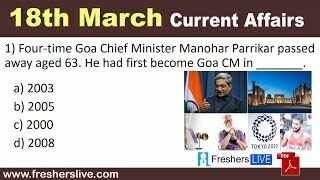 Current Affairs 18th March 2019: Instantly obtain Latest Current Affairs 18th March 2019 with all essential info, Be the first to know all the Current affairs 18th March 2019 top news, Major Issues, Current happenings, Important events in National as well as International level with clear explanation. For all competitive exams and Interviews, equip yourself with the Latest Current Affairs 18th March 2019 granted here. The National Green Tribunal (NGT) has directed six States to submit by April 30 action plans for bringing air quality standards within the prescribed norms, failing which they would be liable to pay environment compensation of Rs.1 crore each. A Bench headed by NGT Chairperson Justice Adarsh Kumar Goel ordered the Chief Secretaries of Assam, Jharkhand, Maharashtra, Punjab, Uttarakhand and Nagaland governments to submit their plan within the stipulated time. Aviva Life Insurance announced the launch of ‘Wings’, a specially designed mentorship program to empower the female workforce. Wings program is an initiative of the SHE division of Aviva Life Insurance for mentoring all the women employees in Aviva. The Board of Control for Cricket in India (BCCI), announced Dream11, India’s Biggest Sports Game, as the Official Partner for the VIVO Indian Premier League (IPL). This 4-year exclusive partnership will begin with the upcoming IPL 2019 season. Additionally, the ‘Official Fantasy Game’ of IPL will also be powered by Dream11. Santosh Jha presently Deputy Chief of Mission, Embassy of India, Washington appointed as the next Ambassador of India to the Republic of Uzbekistan. Presently, Mr Jha working as Deputy Chief of Mission, Embassy of India, Washington DC USA. Diksha Dagar became the second Indian woman golfer to win an event on Ladies European Tour after clinching South African Women's Open in Cape Town. Aditi Ashok was the first Indian to win on the Ladies European Tour after clinching Hero Women's Indian Open in Gurugram in 2016. HDFC, India’s largest mortgage lender, which has agreed to merge its low-cost arm Gruh Finance Pvt. Ltd. with Bandhan Bank, can hold 9.9 percent in the bank, according to its exchange filing. That’s the maximum a non-banking finance company can own in a private bank. HDFC had sought approval for 14.96 percent.